“We had a football team and I unfortunately had to keep the ball all the time, although it wasn’t easy to carry it about with you. Our sleeping quarters were everywhere and any wee corner you could get into. We got this old barn one time and I was sleeping in the hay-loft and the other men were all down below. And here didn’t the rats scrape and scrape and nearly drive me up the walls. I had to get up in the middle of the night, and I threw the ball at them, and it bounced from one man to another, and they called me for everything for throwing it down. But the blinking rats were driving me up the walls, they were terrible! Before the Battle of the Somme I captured a German: well, I didn’t capture him as he came up to me with his hands up. And some of the men- like, all you could see was the tops of their heads looking up over the trench-well, anyway, they were shouting at me: “Shoot him, Tommy, shoot him!” But I didn’t like to shoot a man in cold blood, it wouldn’t have been right anyway. So I took him down a hill and searched him at the bottom, but he had nothing on him- we got word at one time that the Germans had been using daggers. I don’t believe it though, because I don’t think the Germans were really bad people or wicked in any way, as far as I could see. So I walked him along to where the reserves were coming up and I told him to go on down there, and he walked down the hill with his hands up, and that was the last I saw of him. I went back to my own battalion as the attack had opened up (1st July 1916), and I went in with them. I didn’t get very far until someone fired a gun and hit me in the leg. I fired back at him and hit him in the face, and I could see the blood running out of his face, in gushes like, coming out of his cheek. He was a nice looking young man , but he was a sniper, and if I hadn’t got him God knows how many people he would have killed before we would have got him. Anyway I was still able to walk and I went down into the trench. I only got a few yards when a shell burst above my head and I was all shrapnel in my shoulders and my back; my arms had pieces of shrapnel everywhere, so I went out for the count right there. When I wakened up on the 4th of July I was in Colchester hospital. I don’t remember how I got from France to England. John Spencer tells this story: There was a halt in the marching, and he was hanging over this gatewaywhen down comes a nun. John says,”Bonjour Madamoiselle”, and she replies ” What are you blethering about?”. I think she was from Kilkenny, but what on earth she was doing there we couldn’t imagine. She was a lovely girl and John talked about it with great gusto. Oh yes, it was his pet story. 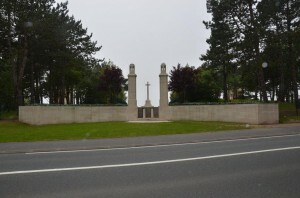 En ce même jour, le premier juillet mille neuf cent seize, au début de la bataille de la Somme, les hommes de la fameuse trente-sixièmer sortirent du bois de Thiepval pour rejoindre ce point sur la Redoute de Schwaben, s’inscrivant ainsi dans les pages de l’histoire, de la légende et de la renommée. Cette avancée, sous un feu continu, qui leur coûta cinq mille cinq cent morts et blessés, est pour nous l’épisode le plus mémorable de la première Guerre Mondiale et représente une des démonstrations de courage les plus remarquables dans l’histoire de l’humanité. D’un courage tout aussi grand étaient les hommes de la seizième division irlandaise qui se battirent à Guillemont et Ginchy en septembre de la même année. J’abrite en lettres d’or l’amour d’Ulster. En ce jour sacré nous commémorons le sacrifice de ces héros tombés pour la liberté. Nous ne cherchons pas seulement à les glorifier, mais à veiller à ce que un tel désastre ne se reproduise plus jamais. Thosaigh Cath an Somme ar an chéad lá Iúil 1916, cothrom an lae inniu. Ar an lá sin, tháinig an Rannán 36 (Uladh) amach as Coill Thiepval, agus na saighdiúirí cróga ar a mbealach ions ar Redoubt Schwaben. Ar shroicheachteáil an phointe sin dóibh, bhain siad amach áit iontach sa stair, agus onóir leanúnach a mhaireas go deo. In ainneoin gur cailleadh 5,500 saighdiúir, seasann an tionscnamh seo amach mar an eachtra is mó agus is cróga sa Chéad Cogadh Domhanda agus tá muid bródúil as, cionn is gur é an léiriú is mó é den misneach daonna i stair an duine. Thaispeáin laochra an Rannáin 16 (Éireannach) an chalmacht chéanna nuair a throid siad ag Ginchy agus Guillemont i Meán Fómhair na bliana sin. Tógadh an túr cuimhneacháin seo ar an áit naofa seo fríd sintiúisí poiblí a bhfuarthas i nDún Thuaidh. Cuireadh le chéile é mar mhacasamhail ar Túr Heléin i gceantar Chlann Aodh Buí an áit a dteachaidh an Rannán 36 (Uladh) faoi thraenáil. Tá téacs de dhán, greanta i litreacha órga, le feiceáil istigh i dTúr Heiléin i gClann Aodha Buí. Is é an Tiarna Alfred Tennyson an t-údar. Istigh i dTúr Uladh, ar an láthair seo, tá macasamhail den dán céanna le léamh. Tá dornán focal athraithe chun aitheantas a thabhairt d’ fhir Uladh. Agus, mar sin, tá muid tagtha in éineacht le Cumann an Somme, chun cuairt eile a thabhairt ar Thiepval agus le bheith ag spaisteoireacht i ngarraithe Valhalla, áit a bhfuil faoi chúram gheanúil ag Coimisiún Uaigheann Cogaidh an Chomhlathais. Is beannaithe an lá inniu is muid ag cur ceiliúradh ar bun i gcuimhne ár bpobal muirneach a d’íobair iad féin chun saoirse. Ní chun cogadh a ghlóiriú atá muid anseo ach chun deimhin a dhéanamh nach dtarlódh a leithid sin arís. Secretary of State for Northern Ireland Owen Patterson, Minister of State Jonathan Bell, Irish Minister of State Dinny Mc Ginley, Distinguished Guests, My Lords, Ladies and Gentlemen. On this day, 1st July 1916, 96 years ago, at the commencement of the Battle of the Somme, the men of the famous 36th (Ulster) Division advanced out of Thiepval Wood towards this point on the Schwaben Redoubt and on reaching here, passed into the pages of history, legend and high renown. This advance, when they sustained 5,500 casualties, under continuous fire, is for us the most memorable single episode of the First World War and stands as one of the finest displays of human courage in the history of mankind. Equal in valour were the men of the 16th (Irish) Division who fought at Guillemont and Ginchy in September of that year. This memorial, erected on this sacred site by public subscription, raised in the North of Ireland, was modelled on Helen’s Tower at Clandeboye, near Bangor,where the 36th (Ulster) Division trained. In Helen’s Tower at Clandeboye there is inscribed in letters of gold a poem by Alfred, Lord Tennyson, of which the first four lines have been slightly altered in the memorial room in this Ulster tower to serve as a fitting tribute to the sons of Ulster who fell here. Ulster’s love in lettered gold. And so we have come with the Somme Association to visit Thiepval once more and to walk again in the gardens of Valhalla so lovingly cared for by the Commonwealth War Graves Commission. On this sacred day we commemorate the sacrifice of our loved ones who died for freedom. We do not seek to glorify war but rather to see that it does not happen again. It may be that there are certain setbacks in history of such magnitude and heroism that they serve to sustain and temper a people instead of weakening them. Or else, perhaps the setbacks come to have an energising, emblematic power. 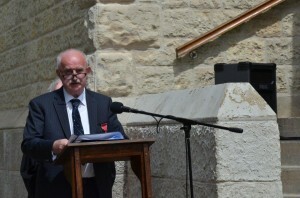 So the importance to us of our Ceremonies at the Ulster Tower and Guillemont. 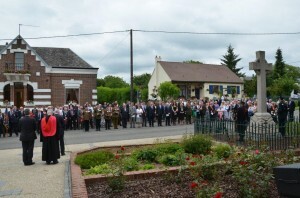 Following the re-dedication of the Ulster Tower in 1989 by Her Royal Highness Princess Alice, Duchess of Gloucester, under the auspices of the Farset Somme Project, the Somme Association was formed the next year to emphasise the contribution of the Irish soldier, both North and South in the tragedy that was the First World War. 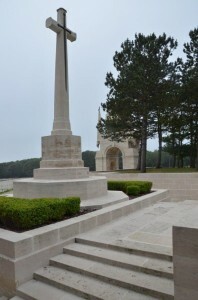 As we enter the run-up to the Centenary of the Battle of the Somme in 2016 and the formation of Northern Ireland and establishment of the Ulster Tower at Thiepval in 2021, we would thank you on behalf of our President, His Royal Highness Prince Richard, Duke of Gloucester, all for your support for the Somme Association both here in France, Belgium and Gallipoli, especially as we enter a new and challenging chapter of our history. 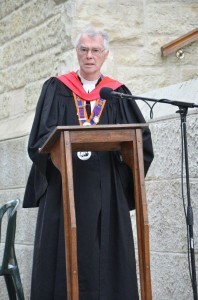 Merci beaucoup, Go raibh maith agaibh, Dank u wel, Haben Sie vielen Dank, Thank you very much. Secretary of State for Northern Ireland , Northern Ireland Minister of State , Irish Minister of State, Distinguished Guests, My Lords, Ladies and Gentlemen, On behalf of the Somme Association could I welcome you to our annual Somme Commemoration ceremony. On this day, 1st July 1916, 96 years ago, at the commencement of the Battle of the Somme, the men of the famous 36th (Ulster) Division advanced out of Thiepval Wood towards this point on the Schwaben Redoubt and on reaching here, passed into the pages of history, legend and high renown. This advance, when they sustained 5,500 casualties, under continuous fire, is for us the most memorable single episode of the First World War. “People of France, mother of nations, we thank you for your generosity and kindness to these our children who rest now in peace in the most beautiful gardens on earth. We pray that their sacrifice will not be in vain and that there will be no more war and that the peoples of Europe will walk together in mutual forgiveness, understanding and respect until the end of the world”. “Peuple de France, mére des nations, nous vous remercions de votre générosité pour nos enfants qui reposent en paix dans les jardins les plus beaux du monde. Nous prions pour que leur sacrifice n’ait pas été vain, pour qu’il n’y ait plus de guerre, et pour que les peuples d’Europe puissent marcher ensemble et se pardonner, se comprendre et se respecter mutuellement jusqu à la fin des temps”. Bevölkerung von Frankreich, Mutter von Nationen, wir danken Ihnen für Ihre Grosszügigkeit und Freundlichkeit für unsere Kinder, die in diesen schönen Gärten in Frieden ruhen. Wir beten, dass das Opfer unserer Kinder nicht umsonst gewesen ist und dass es zu keinem weiteren Krieg mehr kommen wird, dass die Völker Europas in Vergebung, Verständnis und Respekt miteinander in die Zukunft gehen können. “Sons of Ulster, Soldiers of Ireland do not be anxious. The war is over – both here and in you beloved Ireland. The Western Front is no more and Ireland at last is at peace with herself and with her people. We will always remember you, so long as the sun shines and the rain falls and the wind blows and the great river Somme runs gently to the sea”. “A Fheara Uladh agus a Shaighdiúirí na hÉireann, ná biodh imni oraibh. Tá an Cogadh thart – ní amháin san áit seo, ach in bhur dtír dhílis féin in Éirinn. Níl an Fronta Thiar ann níos mó, agus, so deireadh, tá tír na hÉireann faoi shíocháin léi féin agus len a pobal. Ach chomh fada is a shoilsíonn an ghrian, agus a thiteann an fhearthainn, agus a shéideann an ghaoth, agus chomh fada is a théann abhainn mhór an Somme go caoin chun na farraige, bedh cuimhne againn araibh go deo”. Lecel wacin ho hecel lena, oyate kin nipi kte. The Somme Association would like to thank The Band of The Royal Irish Regiment(TA); The 2nd Battalion The Royal Irish Regiment;Rossen Platoon, 4th Battalion The Royal Welsh, (Clwyd AFC) and especially The Rev Martin Smyth. 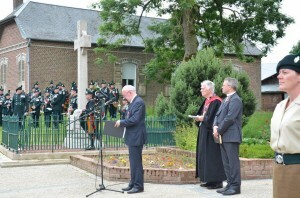 Somme Commemoration: Chairman’s welcome, 16th (Irish) Divrision Memorial Cross, Guillemont, 1st July 2013. DE LA PART DE L’ASSOCIATION DE LA SOMME, JE TIENS À VOUS REMERCIER DE VOTRE ACCUEIL AUJOURD’HUI A GUILLEMONT AINSI QUE DE L’HOSPITALITÉ GENEREUSE QUE VOUS NOUS AVEZ OFFERTE. NOS AMIS FRANCAIS NOUS HONORENT TOUJOURS ET NOUS SOMMES CONSCIENTS DU FAIT QUE LES FILS D’ULSTER ET D’IRLANDE QUI REPOSENT EN PAIX ICI SONT DEVENUS PLUS QUE DES FILS D’ULSTER ET D’IRLANDE. CE SONT MAINTENANT DES FILS DE LA FRANCE. Here at Guillemont and neighbouring Ginchy, Redmond’s 16th (Irish) Division lost heavily in the first ten days of September 1916 with casualties of 240 of its 435 officers and 4090 of 10410 other ranks among its infantry and engineer units. Two-thirds of these were wounded, another fifth missing, with the remaining 650 killed in action. Among the 9thDublin Fusillers were Private James Liddy of Amiens Street, a well known Dublin confectioner, as well as Ginchy’s best known casualty, Lieutenant Tom Kettle. The poetry of Francis Ledwidge evokes an Ireland of traditional nostalgia. But Seamus Heaney had said of Ledwidge that his fate was more complex and more modern, his moral courage alone gave him “membership in the company of the walking wounded, wherever they are to be found at any given time.” He was buried, No 5, in row B of the second plot in Artillery Wood Cemetery, about 3 miles North of Ypres in Belgium, and has joined the ranks of such fellow poets as Wilfrid Owen, Julian Grenfell, Rupert Brooke and Siegfried Sassoon. “Sons of Ulster, Soldiers of Ireland do not be anxious. The war is over – both here and in your beloved Ireland. The Western Front is no more and Ireland at last is at peace with herself and with her people. We will always remember you, so long as the sun shines and the rain falls and the wind blows and the great river Somme runs gently to the sea”. A fine sycamore towers in the front garden of a small house in the Donegal village of Gortahork. People can’t remember a time when it wasn’t there. Before he travelled to France last weekend for the Battle of the Somme commemorations, Minister for the Gaeltacht Dinny McGinley heard the poignant story of this stately tree. Dinny was visiting his old friend Paddy McGowan who told him about his uncle who left Gortahork in 1914 to join the British army. On the morning before he departed, 18-year-old John McGowan planted a sycamore sapling as a reminder to his family to keep him in their thoughts. The young Donegal man was first sent to the Dardanelles, where he sustained a hand injury. After recuperating, he was transferred to the Somme, never to return home. But the tree he planted now soars above the garden, 99 years after he planted it. Dinny was happy to oblige. Which is how it came to pass that the Minister of State travelled to France accompanied by the special branch. Last Sunday, in the company of Niall Leinster of the Somme Association, Dinny travelled north to Étaples Military Cemetery in Pas de Calais. There, after a little searching, they found the grave of “5169 Private J McGowan, Royal Munster Fusilier”. He died on August 2nd, 1916. 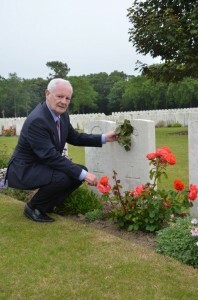 Dinny described the emotional moment when he stood at the headstone.